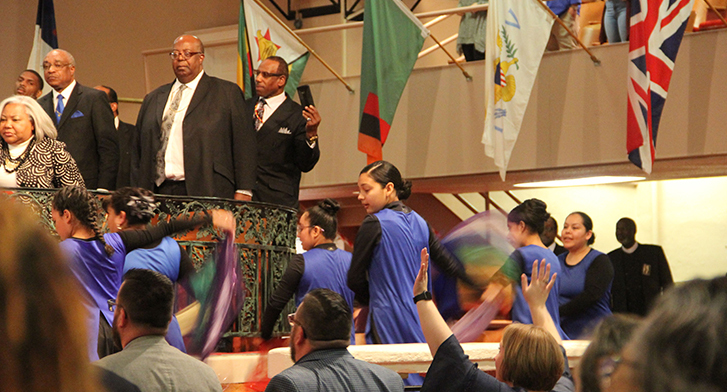 The 25th commemoration of the historic “Memphis Miracle” occurred in March. 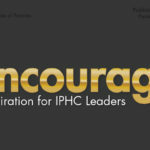 IPHC leaders joined with the nearly 200 delegates of Pentecostal and Charismatic Churches of North America (PCCNA) to thank God for the courage and humility demonstrated by Pentecostal leaders in 1994. I was honored to represent the IPHC there. One of the key leaders of the historic event was the late IPHC Bishop B.E. Underwood. (You can read more about the 1994 event here). The celebration was held at the historic Mason Temple, the headquarters church of the Church of God in Christ (COGIC) in Memphis, Tennessee. The largest Pentecostal denomination in the USA, COGIC’s roots go back to the Azusa Street revival. G.B. Cashwell, who was responsible for leading the IPHC family tree into Pentecost, met with COGIC founder Charles Mason. One of the notable aspects of Cashwell’s ministry was his recognition that the Spirit’s work at Azusa Street was a divine interruption into the racial divisions that have marked the USA since the 17th century. 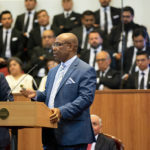 During the service at Mason Temple on March 19, COGIC Presiding Bishop Charles Blake observed that during the Civil Rights era few white Pentecostals stood with blacks as they marched for full inclusion in American life. It was a sad moment as Blake, speaking the truth in love, mentioned that Jews, Methodists, and others stood with them, but his own Pentecostal brothers were absent. I am careful to not be too harsh on that earlier generation. In our own time, we struggle to know what to say and do. 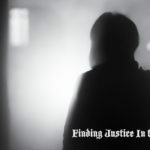 Publicly standing for justice is never easy. That’s because justice is so often mixed with cultural and political dynamics. We worry that taking public stances will divide our churches; we worry that public issues will become more important than evangelism; we worry that we will be criticized and even rejected (all three not without merit). But there are times when standing for righteousness and justice are worth the costs. Then, and now, are such times. Bishop Blake spoke the truth in love about Pentecostal failures since Azusa Street, and his words have left me asking myself about the needed courage and wisdom for our times. On that Tuesday night in Mason Temple, I was granted a few minutes to speak behind the same pulpit that the late Rev. Dr. Martin Luther King, Jr. stood when he preached his last message on Wednesday night, April 3, 1968. 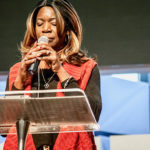 As I prepared my remarks, the Holy Spirit led me on a personal journey reminding me of different places where my heart, my thinking, and my actions were challenged. So, what follows below is a portion of the prepared remarks I gave in Memphis. 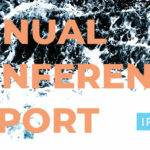 “We, as Pentecostals, have been on a journey since 1994. For most of us, that journey goes even further and includes personal vignettes as well as our corporate experience. In early March 1965, as a teenager in Georgia, I watched on television the violent response to the march in Selma, Alabama, that occurred 54 years ago on Bloody Sunday, March 7, 1965. Two more marches occurred that month, including the third on March 21, causing us to remember this significant event while we are here in Memphis. As a teenager, I was angered and grieved by what I saw of the violent racist attacks. Little did I know that in 1985, the 20th commemoration of the March, I would be a U.S. Army Reserve Chaplain in a convoy returning from annual training in Mississippi to Georgia in the middle of the traffic commemorating the March over the Selma bridge. I remember our African American soldiers, in uniform serving our nation, being cursed at and mocked by crowds of angry whites, with law enforcement sneering as they stood idly by. Again, I was angered and grieved by what I saw and heard and that such racist anger remained. Responding to the obvious injustices was easy. What I didn’t know was how blind I remained to the hidden and subtle injustices that continue to plague us. Not until a few years ago in a conference at the National Association of Evangelicals in Washington, DC did I learn of the systemic redlining of African American communities by banking institutions, intentionally denying them the services that most of us take for granted. Not until a couple of years ago, through Christian Churches Together, did I learn that “the talk” with our teenagers means something very different from white and black families. For most white families it’s about the birds and the bees with our teenage children. For black families, it’s about what you do when stopped by the police. A year ago, I learned from African Americans that this year, 2019, they are remembering the quad centennial of the first blacks coming to the English colony of Jamestown in 1619. I would have not made that connection on my own. I needed to be taught. 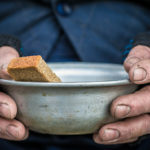 And even recently, with a PCCNA race relations resolution, it took me time to connect racism with poverty. While poverty affects people regardless of the race, it took me time to comprehend that racism exacerbates poverty in ways I did not understand. Thankfully, my colleagues at PCCNA quickly joined me in correcting an earlier statement in which I had ignorantly separated the two issues. It was corrected by instruction. As Jesus touched a blind man twice, I am aware I need Jesus to touch me many times so that I can see my brothers and sisters as He sees them, and we all can see better as Spirit-filled followers of Jesus. The journey continues.